A secluded farm somewhere in America’s heartland. Lee Abbott (John Krasinski) continually works augmenting his gigantic ham radio setup, constantly hoping he can amplify the signal to the point he can hopefully converse with every corner of the globe if the need were to arise. 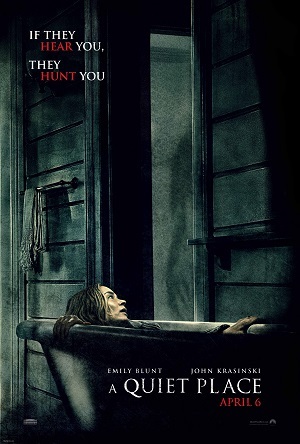 His wife Evelyn (Emily Blunt) does their laundry almost entirely by hand, hanging the wet clothes out to dry constantly on edge that an unseen evil might be lurking somewhere in the cornfield. Their deaf daughter Regan (Millicent Simmonds) and her younger brother Marcus (Noah Jupe) play their nightly board games on the floor, rolling dice on a cushioned rug and utilizing a variety of stuffed and cloth-like tokens as playing pieces instead of utilizing anything made of more solid material. Running around barefoot, creating pathways of softened sand in order to cushion their feet and to avoid the inadvertent rustling of leaves or the shuffling of gravel, removing most of the doors from the buildings on their property, they’ve done just about everything possible to reduce the sounds they might make to practically nothing. Why? Something is hunting, not just them, but all of humanity. Something drawn to sound. Something that, if it were to find them, would instantly devour them, and as this is a family of fighters each member is determined to do whatever it might take in order for all of them to survive. 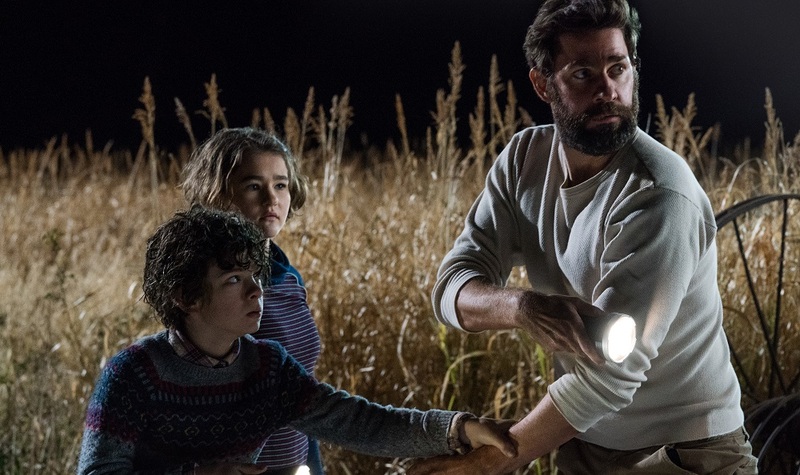 Krasinski’s sophomore directorial outing after the little-seen comedy-drama hybrid The Hollars, the unsettling creature feature A Quiet Place is a superlative genre gem that held me nervously spellbound for each second of its 90-minute running time. Reveling in silence, utilizing an uncomforting sound design mix that puts the viewer right into the center of the action, featuring a crackerjack score from veteran composer Marco Beltrami (Logan) that’s just as much a character inside the movie as any one of the Abbotts prove to be, this is a spectacularly tense adventure that ratchets up the suspense with something akin to Hitchcock-like confidence. Krasinski hasn’t just hit it out of the park, he’s made a science fiction-based horror opus that’s the best thing to hit theatres since 10 Cloverfield Lane snuck into theatres back in 2016. 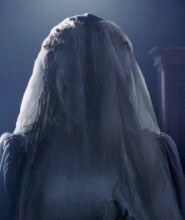 This is a strong, imaginatively spine-chilling shocker, and the less one knows about what is going transpire before watching the greater their enjoyment quotient is likely to be. With that being the case, I’m not going to say a heck of a lot more. I will add that the acting is terrific across the board, especially from Blunt and Simmonds. The former has long been a magnetic talent who always seems to have an uncanny ability to make any more she’s appearing in hers with what feels like very little effort. Here, Blunt mines emotional territories that are positively voluminous, Evelyn’s saga a never-ending series of protectively maternal highs and lows that all revolves around her unceasing desire to see her children survive this surreal, monster-infested apocalypse. It’s a masterful tour de force that builds to a ferociously compelling climax, the actress holding things together in a manner that’s unquestionably divine. Then there is Simmonds. After making her stunning debut in Todd Haynes’ Wonderstruck just last year, young newcomer once again amazes. The deaf actress conveys so much through her eyes and body language it is absolutely impossible to take one’s eyes off of her. The level of rage building inside of Regan, the regret, the shame, the feeling that she is not worthy of the love her parents proclaim they are sending her direction, all of that and more comes through. But when the time comes for this little dynamo of courage and enthusiasm to become a hero, it’s never a question that she’ll shirk her responsibilities, especially as it pertains to protecting Marcus. Simmonds makes all of this feel genuine in a way that’s heartrending, this performance a thing of beauty I was thoroughly captivated by. Krasinski never lets up, his directorial hand moving various pieces this way and that as he plays his little cat and mouse most dangerous game with astonishing virtuosity. He allows Bryan Woods and Scott Beck’s scenario the freedom it needs into order to breathe and grow, rarely allowing his imprint to feel heavy or authoritarian in a way that might dilute the constant stress the scenario inherently overflows in. 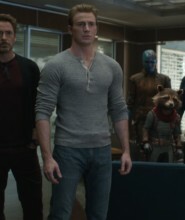 Krasinski also does marvelous things with both Charlotte Bruus Christensen’s (Molly’s Game) eerily sumptuous cinematography and Jeffrey Beecroft’s (Dances with Wolves) suitably weathered and lived-in production design, the visual allure of this opus every bit as important as the sound design and complex character constructions both prove to be. 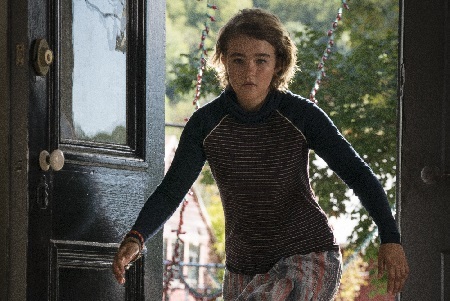 A Quiet Place is close to perfect, this monstrously entertaining chiller a nightmare-inducing smash I’m going to be screaming the praises of for many years to come.